Peter Karuri and his wife Felister stand next to the grave of their eight-year-old daughter at Thamara village in Murang’a on Tuesday. She was killed and dumped in a nearby farm. A child is being defiled and killed in Murang'a every week as the vice threatens to destabilise an already fractured society, studies have shown. In the past month, four girls were defiled and killed in the county. And no one knows the pain of this more than Catherine Njeri. Her four-year-old daughter was found defiled and her tongue and nails removed at Kihiu Mwiri, Gatanga constituency, Murang'a County. The grave of the four-year-old is still fresh, lying less than 50 metres from a two bedroom mud house with rusty mabati roofing. Mercy Njoki was dropped to school but did not return. Eleven days later, her body was found on a path leading to Nginye Dam. "Why did the attacker remove her body parts? It can only mean they will be used in witchcraft," she said. It gets worse for Njeri. No one has been arrested and she claims the chief, Mr Stephen Chege, is intimidating the family. "It has reached a point where we cannot report anything to the chief. When the media reported this matter, we were publicly rebuked at a baraza," she says. 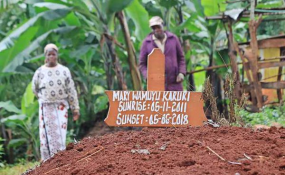 In Muthithi village, Kigumo constituency, another family is still mourning the death of an eight-year-old girl whose body was found dumped in a maize plantation. A postmortem report showed that she had been defiled then hit on the head with a blunt object. The girl's father, Mr Peter Karuri, sobs as he recounts the tragedy of finding his daughter lying in a farm with her school bag next to her lifeless body. In Kigumo, parents are now accompanying their children to school and waiting at the gate after their classes. What could be the cause of these cases? Experts and police are blaming the scourge on drug abuse, dysfunctional families and lack of action by the police. In Muthithi village where cases of defilement have been on the rise, use of bhang is common among the youth and old men. According to locals, the police have information on bhang peddlers but fail to take action. "All the police do is collect money. When we decide to arrest the suspects ourselves, the police tip them off. Some villagers who have been brave enough to report bhang peddlers have been killed," said a Nyumba Kumi head. Sergeant Moses Kimenchu, a professional counsellor and Administration Police officer, said bhang affects the central part of the brain which controls decision making, leading to defilement, murder and suicidal thoughts. Those suspected of defiling school girls are not outsiders. They have been linked to at least three cases of defilement, yet they are still not behind bars. In Muthithi village, Kigumo, another family's child escaped narrowly from being defiled by a 70-year-old man, who allegedly undressed the girl and himself. Angry villagers beat up the man before the police arrested him. He was later charged at Kigumo court with attempted defilement.